1More’s claim to fame and first resounding success, the 1More Triple Driver are renowned among audiophiles for their accurate frequency response coupled with good build quality. What they say about the Triple Driver is true, as they are great headphones whose only flaws are indeed minor. From an acoustic standpoint, they deserve all of their fame! Disclaimer: I would like to thank Tom at 1More Europe for this free unit he sent me. You can read more about 1More on their website. It has to be said that 1More never scrimps in packaging and accessories. 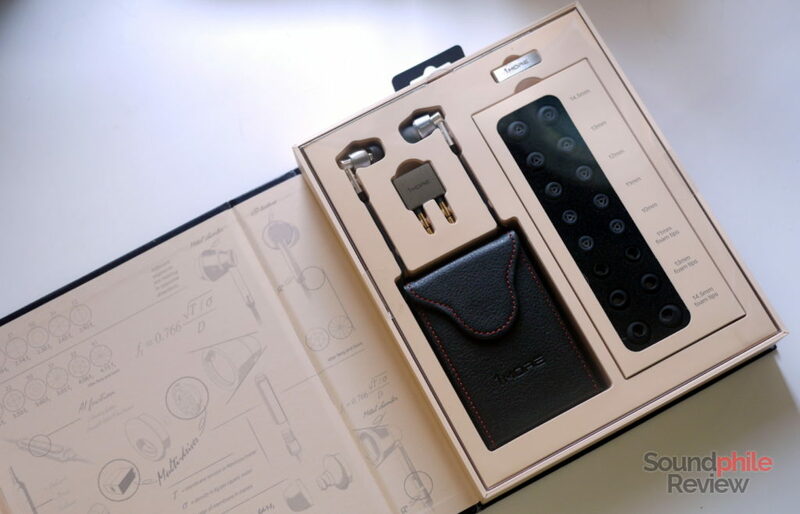 The Triple Driver box includes a hard faux-leather case, a metal shirt clip, an aeroplane adapter, a set of ten eartips pairs (3 pairs foam, the rest in silicone) and a few leaflets including a 1More sticker. The box itself is something that is worth describing, as it is shaped and coloured as if it was a book. A set of magnets keeps it closed. The interior shows a few sketches and a summary description of the earphones. One should not judge a book by its cover, but in this particular case the cover is very well made and a good prelude of what’s to come! If you are familiar with Xiaomi products, then you will find a lot of similarities with 1More headphones. In fact, 1More designs all the headphones by Xiaomi. The 1More Triple Driver is somewhat similar to the Xiaomi Mi In-Ear Headphones Pro, as they both have an aluminium shell of blunt conical shape with an angled nozzle. Similarities end here, though, as the Triple driver are entirely made of aluminium, have a cable with a braided fabric cover and are much less curvy. The shells are in fact cut straight, except for the parts that come into direct contact with the pinnae (those are rounded to provide better comfort). 1More plays with the materials and the colours; the shell is entirely made of aluminium, but there are different shades of grey/silver due to the different polishing. The company logo and the R/L markings are etched on the sides and are clearly visible; as they are etched and not printed, they should last for virtually unlimited time. 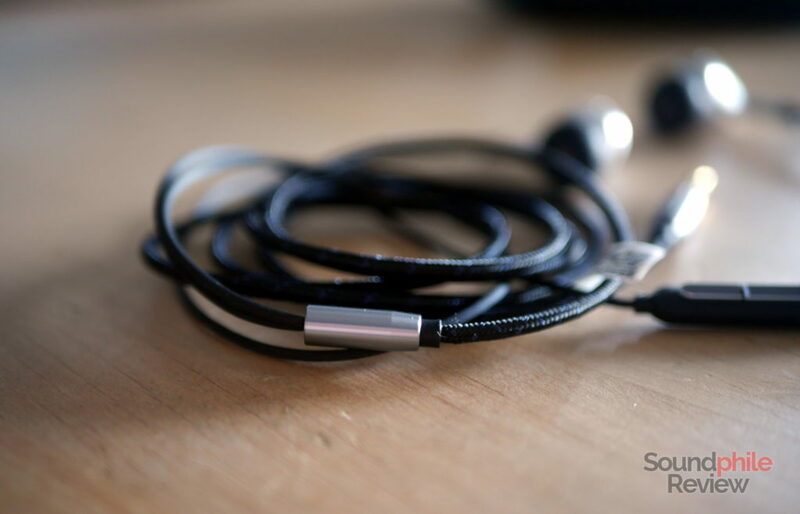 Build quality is top notch: the shells feel sturdy and durable, the cable is good quality and there is no weak point in the assembly; the only thing that is missing is strain reliefs on both earphones and jack. The latter is especially felt as the jack is straight, and is thus exposed to a higher degree of stress when one uses the Triple Driver with a mobile phone stored in a pocket. I found the 1More Triple Driver to be really comfortable, even when used for prolonged periods of time. The slight angle of the nozzle makes it fit well, and the rounded shape of the shell creates no (literal!) pain points. The only issue with this design is that it is not reversible, so you can’t wear the earphones as if they were over-ears (as in, the cable runs around the pinnae). You can still do that, but I suspect that the absence of strain reliefs on the earphones would make this approach wear the cable faster. At ~6 mm wide, the nozzle is certainly larger than typical nozzles, and it is therefore not compatible with eartips from most other manufacturers. Eartips have thus a larger inner bore than usual, but they are also unusual in their shape as they are not really conical – they are wider than they are tall, so they seem flattened. The silicone tips are rather soft, while the foam ones are really good and did not make me long for Comply tips (as they’re the best I’ve tried so far). The 1More Triple Driver cannot provide much isolation with any of the stock tips, at least in my case. All the tips are larger than they are tall, so they are not suitable for deep insertion and do not allow for much isolation. 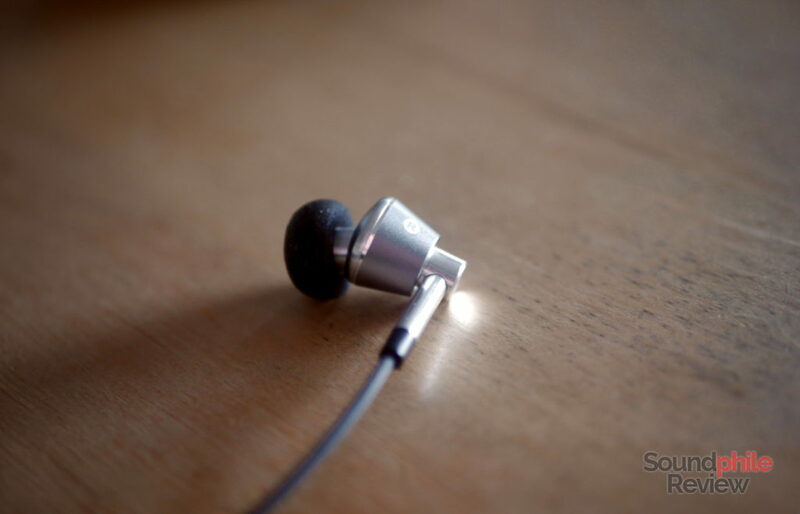 This odd design choice makes the tips quite unique in the panorama of earphones, as the conical shape is preferred most of the time due to its better adaptability. Using different eartips, such as the Comply foam tips I mentioned in my best eartips guide, leads to better results – though the 1More Triple Driver are not heavily isolating anyway. Yes, they do take away a good chunk of background noise that’s present in situations such as public transport or crowded places, but they will never shield you completely from the noise. The cable has a braided fabric cover that should make it more resistant to ripping and kinks. Alas it also makes microphonics much worse, as you can’t realistically walk around wearing the earphones while also keeping good comfort. Making the cable run around the ears and/or using the clip is almost mandatory to enjoy a relatively noise-free experience; failing to do so results in a whole lot of noise drumming your ears. All in all the quality is good, though there is some room for improvement: in addition to high microphonics, there is no strain relief near the jack connector and the upper part, after the Y-split, is covered in rubbery plastic and lacks the fabric cover, therefore being a bit more vulnerable to wear and tear. The microphone works decently well, and allows for clear calls when surrounding noise is not excessive. Keeping it near the mouth helps in making one’s voice sound not distant, but that’s the only thing to say about it – it really works well! I used the following equipment when testing the 1More Triple Driver: Topping DX7, Topping D30 feeding a Venture Electronics RunAbout 2.0bl and Cayin N5ii. An iFi IEMatch was used in conjunction with desktop sources. FLAC files in standard resolution were used. The earphones underwent 100 hours of break-in. As the name suggests, the 1More Triple Driver uses three drivers: one dynamic driver and two balanced armatures. Having been designed as mobile-friendly earphones, the Triple Driver are easy to drive even with low-power sources such as smartphones and tablets. The 1More Triple Driver is not perfectly neutral, instead opting for a small boost in the bass region. Despite this emphasis, the sound signature is very well balanced and pleasant. I never felt like it was excessively leaning towards a side, keeping instead the focus diffused on every part – as opposed to focusing on single areas and making them stand out. In terms of technical ability, the 1More Triple Driver are “just” good: soundstage is limited in its width and has almost no depth, thus giving the listener the impression of a bit of flatness and – sometimes – of a bit of congestion; imaging, on the other hand, is commendably accurate, and it makes it possible to locate instruments spatially with good accuracy. Instrument separation is the best technical feature, as the Triple Driver do a good job at making it possible to tell the different instruments apart, but it is not that good in crowded tracks where multiple layers stack on top of each other. Bass is just north of being neutral, with some added presence in the mid area and at the border with midrange. This emphasis is easy to spot and makes the sound fuller, with body being more robust, but it never translates to excessive presence or imbalance. It’s a bit warmer than usual, but it is discreetly so and it only adds to the sound without taking anything away: bass is in fact always well controlled, never leaking over the mids or sounding oppressive. It goes as low as ~25 Hz, and it starts having enough presence to be felt around 30 Hz – which is impressive. This gives depth to the sound and makes it fun and immersive, aided in this by some good speed. Transients are in fact rendered with great accuracy, and the same speed and control allow the Triple Driver to portray multiple instruments operating in the same space without losing much detail. 1More really did a wonderful job with their dynamic driver! Again, the main adjective to describe the midrange is “neutral”. It is really flat and it can reproduce all instruments equally well, whether it is violins, pianos, guitars or voices. It lacks vividness and it is almost flat in the sense of “dull” at times, though most of the time it sounds really good. It does not have a bias towards any specific area, so everything is correctly represented with the right emphasis and “weight” – and that may be the reason why it sometimes lacks that vitality. To counterbalance that, it has a wonderful level of detail that makes even small nuances pop out: small things like the drums’ leather bouncing, players of brass instruments breathing, bows moving on the strings are portrayed, which is really great (and unusual) for headphones in this price range. Speed is not the best quality of midrange, though, as it does not give that sense of impact that other headphones give – you won’t feel it. The only real issue is that it sometimes sounds a bit congested: adding a bit of emphasis on the upper area with an equaliser largely reduces this problem. Treble is finely crafted: it has good extension that lends it a bit of air, while also having great detail that adds a lot to the scene. 1More achieved a good balance where treble has the right emphasis to be clearly audible at all times and it is crisp with enough detail to satisfy those who place high importance on that. Extension is sufficient as to make treble appear airy, but not sparkling – the (inevitable?) roll-off of the higher frequencies makes it so that the treble area as a whole lacks vividness. It is decently forward in the mix, but it is a bit laid back in terms of tuning – I guess it could cater to treble-sensitive people as well. I listened to many different genres and did not find any that would be unsuitable on the Triple Driver, as their neutral(ish) tuning makes them pretty good with most genres. You may want a bit more emphasis on this or on that, but in general there won’t be any issues whether you listen to jazz, metal or pop. 1More Quad Driver: the Quad Driver are not much different from the Triple Driver in terms of tuning: the only apparent difference is treble being a tiny bit more forward in the mix and more extended, but the rest is almost identical. Midrange is somewhat more vivid, but the clearest difference is in technical ability. The soundstage is much larger and this, coupled with good imaging, makes the sound much airier and large. Instrument separation is also better on the Quad Driver, so it’s easier to distinguish all the different instruments with much more clarity. Given they’re so similar in terms of tuning, the fact that the Quad Driver comes out as better on the technical side makes it the better one. Xiaomi Mi In-Ear Headphones Pro: Xiaomi’s IEM is probably the closest model to the Triple Driver – not only in terms of design, but also in terms of drivers used, though Xiaomi used two dynamic drivers and one balanced armature. Yet, the similarities end here. They are tuned in completely different ways, with the Mi In-Ear Headphones Pro that privilege the higher part of the spectrum. Bass is a bit more recessed and slightly less controlled, while midrange is slightly leaning towards the upper section and therefore sounds a bit bright; treble is much more aggressive and comes out almost on top of the rest, though it is really detailed. 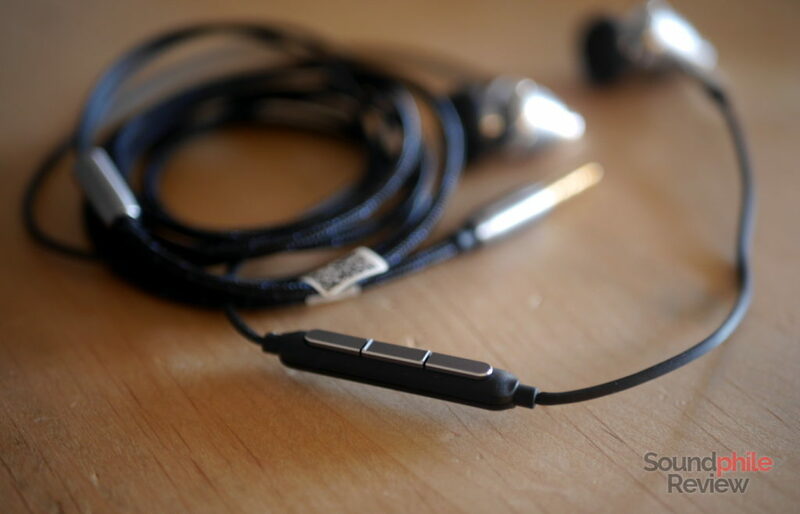 The overall sound signature is peculiar and definitely does not cater to the wider public! 1More’s IEM sound much more balanced and enjoyable. In terms of technical ability, the Mi In-Ear Headphones Pro are better at delivering a large soundstage, but not as good when it comes to imaging. Instrument separation is comparable. The Triple Driver are mostly superior, if you ask me, but it is more of a matter of tuning being much more balanced than clear superiority of detail and technical ability. Tin Audio T2: the Tin Audio T2 is really close to the Triple Driver in most respects, despite being less than half the price. There are, however, a few key differences. The T2 has less bass, especially in the lowest section, and its midrange has more emphasis on the upper section, while treble is a bit more pronounced in its lower part. The level of detail is really similar, but the T2 have the upper hand when it comes to speed – transients feel faster and more accurate. Although the price difference is noticeable, the T2 wins in technical ability: soundstage is much larger, imaging is more accurate and instrument separation is definitely better. The Triple Driver are a bit “better” in terms of tuning as they are more neutral (but that’s subjective and one may prefer the T2’s brighter signature! ), but the technical aspect favours the T2 in the end anyway. I am always sceptical about excessive and unanimous praises about products, but I have to admit that the 1More Triple Driver are as good as you have probably heard. While they are not exceptional, they are really, really good – and even more so if you think about their price. They are built to last with premium materials, they come with a slew of accessories and also offer a great listening experience thanks to an almost neutral tuning that lets you enjoy the music without getting in the way with imbalances, spikes and dips. At $99, the 1More Triple Driver are a great product that can compete on equal terms with headphones twice the price. I see a couple of possible improvements, such as the addition of strain reliefs and a bit of tuning to the midrange in order to add some vivacity, but those are minor things. They’re great as it is, both for audiophiles and common (sane? …just kidding!) people. Ricardo hello. In the price range of 70 to 150 USD wich earbuds do you recommend? Hi Fi audio and build quality. I already have the triple drivers but want to buy something well made and with oustanding audio quality. I would suggest you to take a look at the Tin Audio T3, BGVP DMG and Shozy x Neo CP. The problem is that all of those have an over-ear cable. 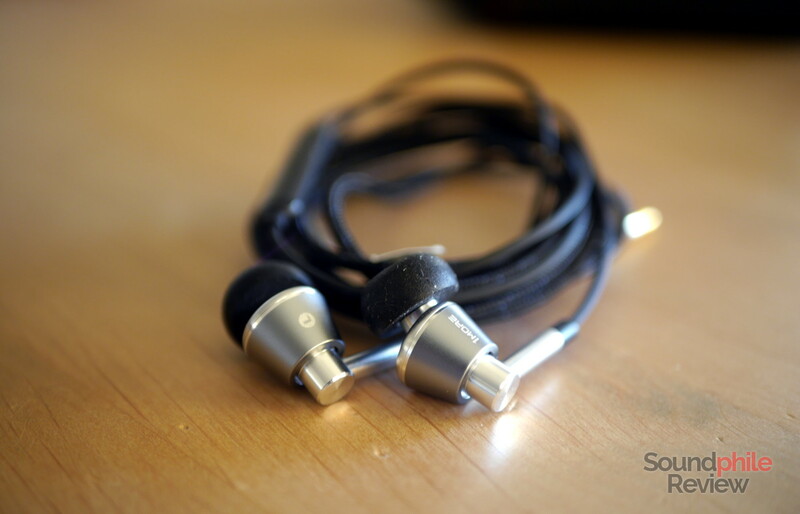 I honestly don’t know other earphones that have a “hanging” cable – the Venture Electronics Zen 2.0 are the only ones that come to my mind, but they’re earbuds and not IEMs.